A new year means membership renewal! We currently do all our renewals in January (31st January being the cut-off point), and during this we get our members to update us with certain things (first aid certificate, CPR training, BBP courses, insurance – all the important stuff!) to ensure that they are still upholding the highest standards possible. Our new (and improved) membership application (for new members) is here: http://www.ukapp.org.uk/membership-application/ – the eagle-eyed among you will notice that now you upload pictures of each required item (first aid certificate, CPR certificate, BBP training certificate, pics of your autoclave/steriliser’s helix test log, insurance – and other important things) directly from your laptop, making it easier and more seamless for people applying as well as being easier for us to process applications (yay!) If you would like a copy of our membership pack, just email me – vicepresident@ukapp.org.uk and I’ll send one out! And our renewal form (current members to submit their renewal) is here: http://www.ukapp.org.uk/2019-existing-members/ – as with the initial application form, you simply send us pics of your ‘important stuff’ via this form, and then we check it and make sure it is all up to date (and that it will be valid on your renewal date). So things like insurance and BBP training which MUST be renewed yearly are submitted so we can make sure all our members have the relevant up-to-date training and safeguarding measures! While we are currently adding to our requirements yearly (next year and 2020 will be the final 2 changes!) we also make sure that each member is up to date on these, and if not we would contact them and offer help and guidance on HOW they can meet the updated requirements. Because we want to help, and we absolutely want to keep our members working o the highest standards. When a new member submits their application, it is checked over by a board member, we make sure that all our membership requirements are met – we do this through the questionnaire answers and the narrated studio walkthrough video that each member submits to show their working environment. Once all the boxes are ticked and we are satisfied that each member meets or exceeds the requirements, they get that all important email telling them they are our newest member, their membership dues are paid, and their certificate is sent out. Each year after this, members are sent an email asking them to renew their membership, which is checked on submission, the member’s certificate is then prepped, printed out and sent to them to display proudly in their studio! Bish, bash, bosh! WHAT BENEFITS COME WITH MEMBERSHIP? 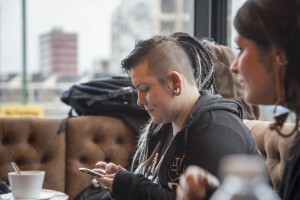 The UKAPP has, in the past, been called upon to help governing bodies develop new legislation and ‘tools’ for piercers and other body art industry professionals, to give statements to the media on piercing topics and to act as a self-regulating union of piercers – meaning that as our numbers grow, so does the influence and impact we can have on the UK’s piercing industry. 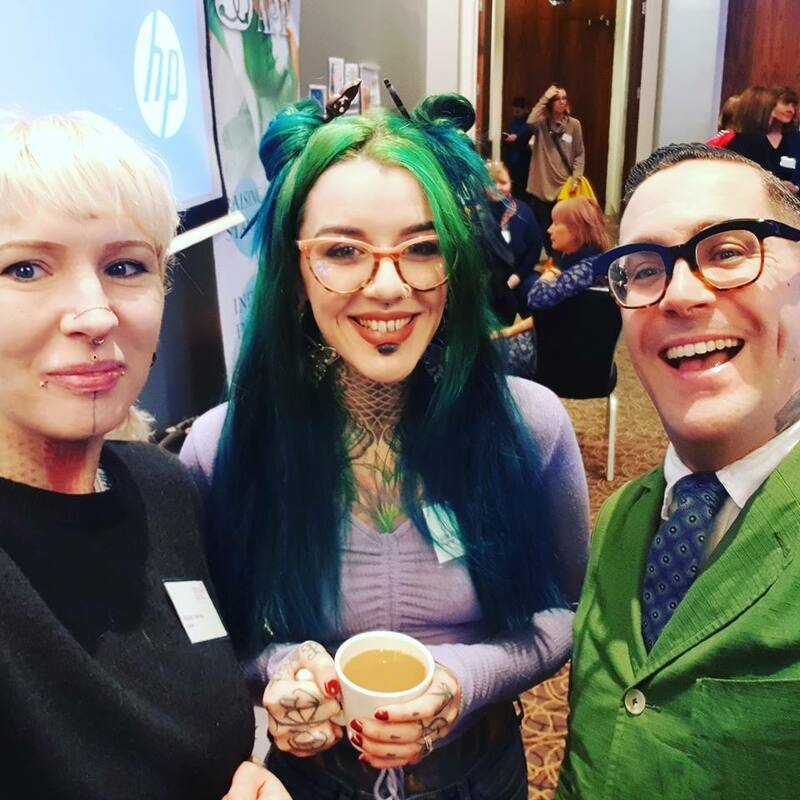 We are recognised as a group of piercers that are striving to up the standards set by local councils for piercers, as well as individuals who are dedicated to working to the highest possible standards within their own work environment. A piercer’s membership with us and their adherence to our standards shows this. UKAPP members have access to our members-only forum on Facebook, where they can chat with other members, ask for help and advice. Furthermore, their details are added to the ‘find a member’ section of our website – meaning potential clients can find them easily, and their membership entitles them to a whole range of perks! 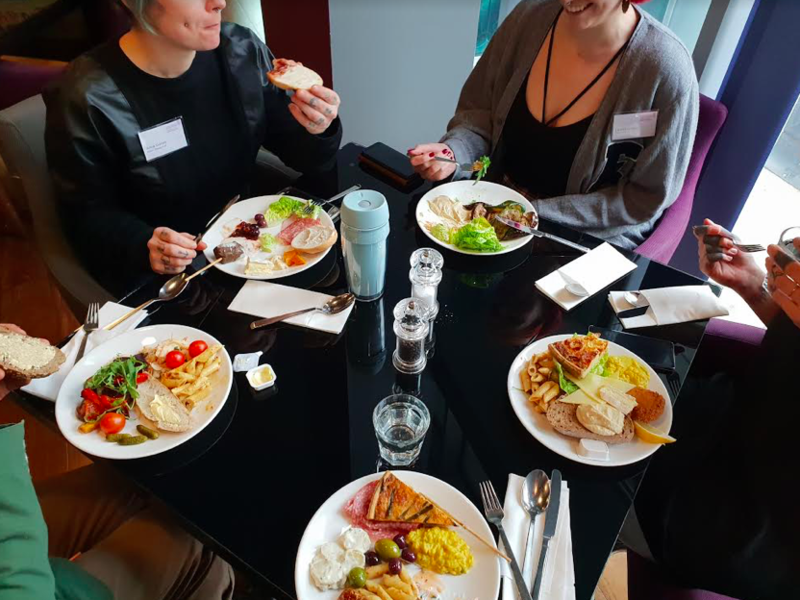 Discounts with suppliers, extra advertising and promotion from our social media squad on Facebook and Instagram and of course a discount on their pass for our yearly conference! In short, our members get a whole load of perks, and in return they help us grow and make our voice louder! We encourage any prospective members to contact us for help with their application, or with any queries about our requirements – and look forward to accepting new members in the coming months! Hello reader and welcome to the UKAPP’s first official blog post! The UKAPP have been wanting to provide our members and the whole community with a monthly blog to better keep you in touch with what we actually do conference to conference. What good fortune then for our first month of blogging to coincide with the first ever “Safer Together” conference. 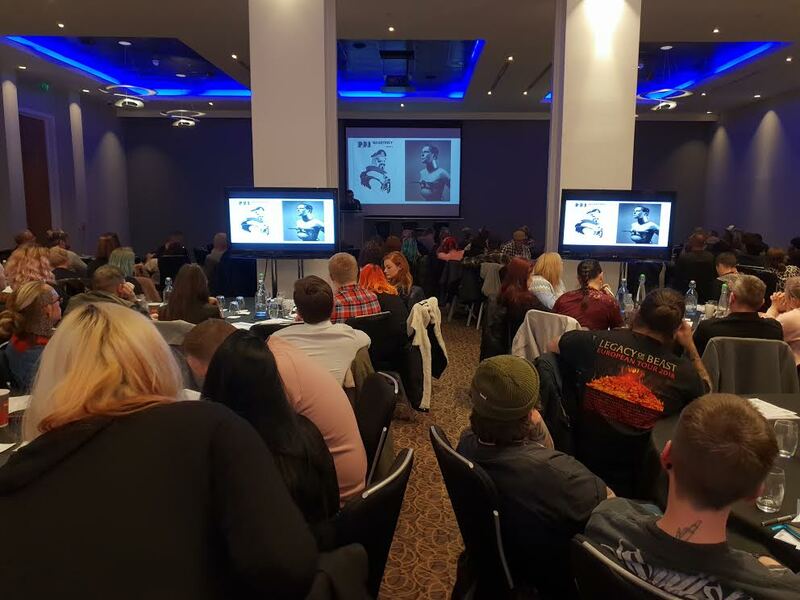 A little bit of background on the conference and our involvement – Public Health Wales passed new legislation in 2017 to introduce a new licence in development called a“Special Procedures” license designed to cover piercing, tattooing and some cosmetic services where practitioners come into contact with blood and needles for example micro-blading. Under this new scheme by 2020 individual practitioners of all experience levels will be required to sit a day course covering fundamental principles of infection control and work specific first aid. At this time there is really no test of competence in place to ensure a practitioner has even a very basic knowledge of cross contamination or infection control and that can pose a serious public health risk. There is also no system in place to prevent practitioners who have previously been shut down for health code violations from simply re-opening down the street with a different employees name on the license, as no individual license is required. 1. Provide a simple, essential, baseline of information all practitioners should have access to and- we cannot stress this enough – it is NOT a suggested replacement of in house training. It will not cover any practical information regarding tattoo application or piercing procedure. It focuses on basic infection prevention and safe work practice controls only. 2. 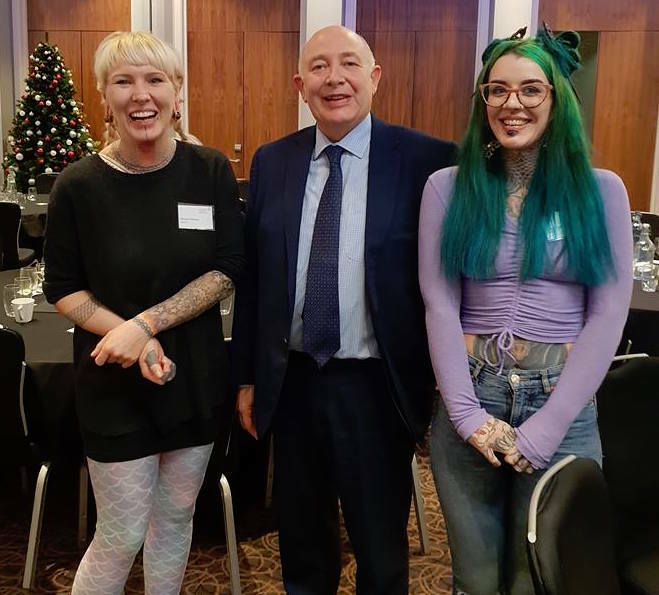 It will give the Welsh government more powers to immediately halt work and prosecute individuals performing unlicensed or illegal tattooing and prevent persons who have previously been found guilty of health violations from automatically being able to work in another premises. 1. Affordable, with a transparent and justifiable cost. 2. Palatable to practitioners of all literacy levels and inclusive to practitioners with learning differences. So, how did the conference go down on the day? Very well actually! If I sound a little surprised when I say that it’s only because I honestly had no idea what to expect. I had met Dr. Sarah Jones of the Health Policy Protection and Legislation Branch before at the UKAPP conference and had no doubt that this was a project of some significance to her but as this event is rather unusual in format, with a blend of Health Officers, Government Officials, Doctors, Tattooer and Piercers, I don’t think any of us knew exactly what to expect. What we actually got was a fantastic reception from the Radisson Blu Cardiff which was a lovely surprise. Hot and cold drinks, biscuits and pastries where available for all attendees and were restocked all through the day with soy milk being readily available at all times.A freshly prepared lunch buffet was laid on that seemed to cater to many dietary requirements and we had full access to the bar dining area which was a lovely breathing space so we weren’t at all confined to the function suite like cattle and you could breeze in and out quite freely for a coffee.The function suite itself was ballroom size (sold out to capacity it appeared) seating was available in round wedding style tables facing the stage. All equipped with table water, pads and pens. There were projector screens at the front and back of the room with an additional two flat screen TV’s in the middle to create an easily followed presentation regardless of seating position. All speakers had access to a microphone so all where audible and there were no significant technical issues.These elements might not seem important but I think it’s relevant to establish that for the ticket price (£30 early bird, £80 last minute) we were very much taken care of and the presentations of the day included 8 speakers, some of whom spoke more than once, who discussed a wide range of subjects from a modern history of tattooing to skin cancer awareness to a dermatologist’s look at infection. Another pleasant surprise was that attendance certificates where also provided to all attendees. 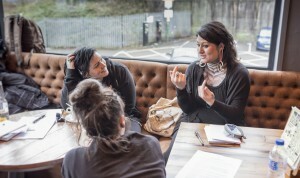 The UKAPP was approached by city council members from England interested in hosting similar events and we were also approached by doctors regarding our FGM leaflets so I definitely think attending these events increases our reach as an educational organisation into sectors we haven’t previously had an “in” to. One thing I did notice was that there were very few people in attendance that I knew already, online or in real life. For me that’s a really, really good thing because what kills a conference in my opinion is a room full of people who all know each other, who all agree already, nodding at each other. While there was a lot of positive feedback real criticisms where also raised and different pockets of the community were represented. So you’ll be pleased to hear there aren’t a lot of negative things I have to say about the conference. If I could make one criticism it would be that there wasn’t really a clear narrative about what’s going to happen now going forward. With a deadline of 2020 it would be good to see some sort of timeline – however the purpose of this conference was to get feedback from the community so I do appreciate that you can’t go forward until that feedback is take into consideration.I also think that some of the speakers slots could have been arranged in a slightly different order to give the day a better structure but that’s hindsight, organising this event for the first time it would be impossible to know exactly how each presentation would land or even what the audience demographics would be. Pretty much all speakers where incredibly receptive to intense Q&A and showed a willingness to address community concerns. Sample material of potential future testing was available to attendees to provide feedback on which really puts attendees right in the centre of the conversation. Something new that I learned was that this new legislation also gives the local authority to power to refuse a license to individuals who have been convicted of a limited number of relevant crimes such as sexual assault, which provides a welcome protection for vulnerable customers. 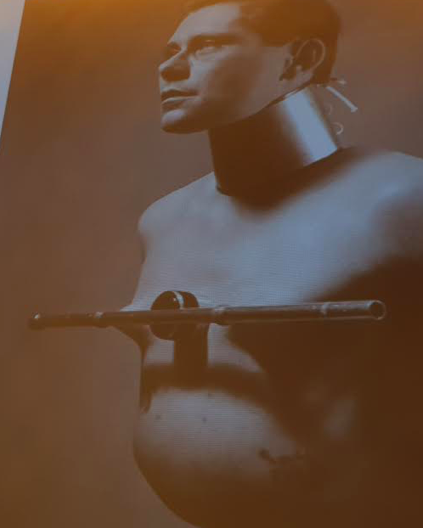 Another point of significance to the piercing community was that during Dr. Matt Lodder’s talk a photograph of the late Fakir Musafar was shown, as well as Shannon Larratt and Mr. Sebastian. These may be images we’ve seen before and for some people reading this, these people will have been in your life. We should as a community take a moment to appreciate the fact that these images where displayed and discussed at a conference attended by and paid for exclusively by the Welsh Government, so that’s really, really cool and it recognises their enduring achievements. We have always been honored to have the support from quality jewellery suppliers over the founding of this endeavor but Industrial Strength UK have been with us from the very start. Without this support, our annual seminars would have had a rockier road to journey to where they are today. 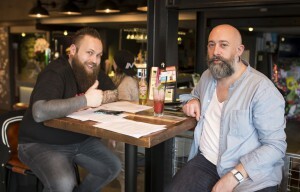 The encouragement alone has been worth its weight but on top of ongoing assistance, general willingness to participate and an overall sense of true camaraderie Industrial Strength UK really do want what’s best for both professional and clients alike. This year’s UKAPP annual conference was held in the Radisson Blue in Birmingham, over the two days of Sunday 4th and Monday 5th of September.Was a total hit! With the second floor dedicated to the UKAPP, its plush surroundings helped keep the atmosphere cozy but still professional. As you entered the hall space visitors were greeted by the welcome desk, staffed by both members of the board and a handful of the kindest volunteers. Here you were able to buy raffle tickets and have any questions answered about classes, times and locations etc. Wrapped around this area was the vending space, two huge spreads from both our friends at Industrial Strength UK – the official UKAPP sponsor – and the delightful crew from Lovely Lobes, who traveled across from Germany to show their support. Registration went swimmingly, with attendees receiving their wristband. A soft material keepsake indicating attendee or volunteer. Next up was Paul King addressing ‘Female genital piercing versus female mutilation’ again a very empowering response. Following right after was Ryan Oullette teaching us Brits how to ‘Upsell jewellery’. Last of the first day was Luis Garcia providing surface piercing technique. By the end of the first day, with venue space slowly emptying, the overall feeling was sheer pride tinged with an indescribable energy. What an experience, so many attendees, so many wonderful comments. Began with Ryan Oullette and ‘Ear piercing fundamentals’. UKAPP board to make an announcement. Luis Garcia to give his last class, ‘Advanced ear piercing’. 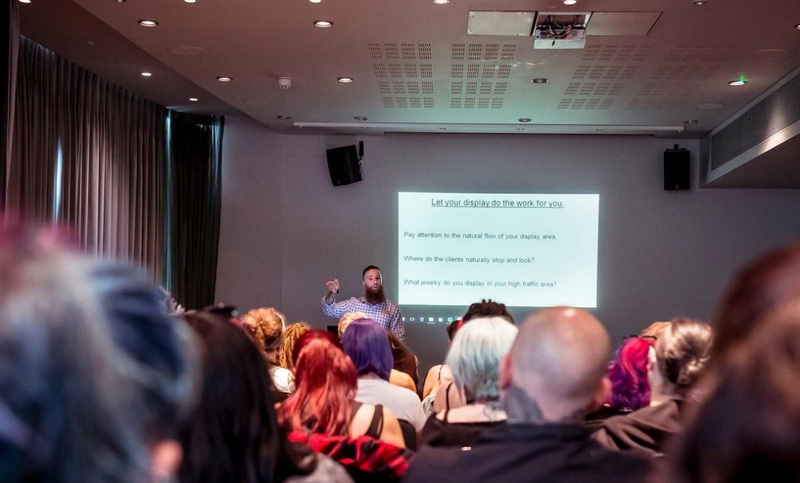 The event finale had local Matt Lodder, a historian and anthropologist in the field of body modification, piercing and tattooing. together to tackle the issue of FGM and the French government has convicted over 100 people but the UK government hasn’t convicted anyone. Due to the lack of UK convictions Raph explained that a worry of a piercer being made a scapegoat is a very real possibility, especially in areas with high ethnic diversity. Statistics state that around 12% of the UK population are victims of FGM (although when asked where these statistics were from Andrex informed us this is one of the questions she has put in the POI request she has made). Andrex explained to us that she has been placing Freedom of information requests to the World Health Organisation to find out where they are getting the data that they have used to put together the legislation in the UK. Once Hate Hate has this information they can work towards combatting the restrictions placed on our idustry. This is a mammoth task as the World Health Organisations nearest office to the UK is based in Denmark and as such they don’t fall under UK law. As Andrex is not a piercer she is able to place these FOI requests free of charge as she has no professional interest. This is an amazing resource for the piercing industry as FOI requests cost tens of thousands of pounds each. The process of bringing FGP back to the UK will be a slow one and the UKAPP ask that any piercer who can help Hate Hate to please do so. Hate Hate request that information is kept out of the public eye for now to allow them time to build momentum with their movement. The issue of informed consent came up and it was recommended that all piercers research informed consent form the medical world. The current issue of daith piercings being linked to curing migraines was discussed. The general consensus was that this will all blow over. 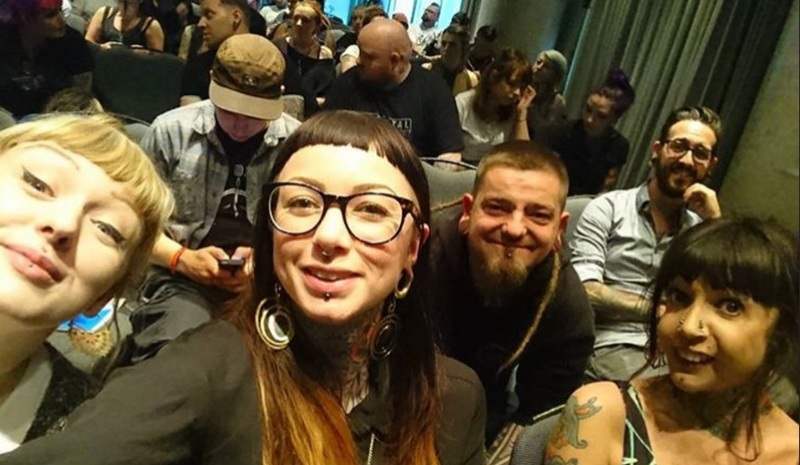 A main point that came up was that everyone agreed that no piercer should be advertising the ability to cure any medical condition as piercers are not medical practitioners.